I can officially say I have exceeded mine and everyone to try's expectations with these doughnuts. I'm not going to lie, sometimes with my baked goods since I always strive to create the most healthy, nutritious, "clean" treat, they aren't always everyones favorite taste-wise. A lot of vegan, gluten free baking can taste quite dry so it was my mission to pull something off that WOW'd everyone. Since so many were asking for my banana bread recipe, I wanted to do something like it. However, I felt guilty since each time I was using a SimpleMills box to make my banana bread. Honestly though it is the healthiest ingredients, and so simple and no banana bread I've made from scratch has turned out as tasty as it does when I bake with this mix. I found a recipe online (https://acleanbake.com/chocolate-chip-banana-bread-doughnuts-with-peanut-butter-frosting/) that used the simple mills banana bread mix but adding other ingredients to create DOUGHNUTS. Best idea ever. So I took this recipe and spiced it up a bit to what I thought sounded best... and then these little circles of heaven came into my life. VERY VERY happy about it. Would obviously recommend. PS: Yes these are Gluten free, Grain Free, Egg free, Vegan (almost all the free's).... You're welcome. 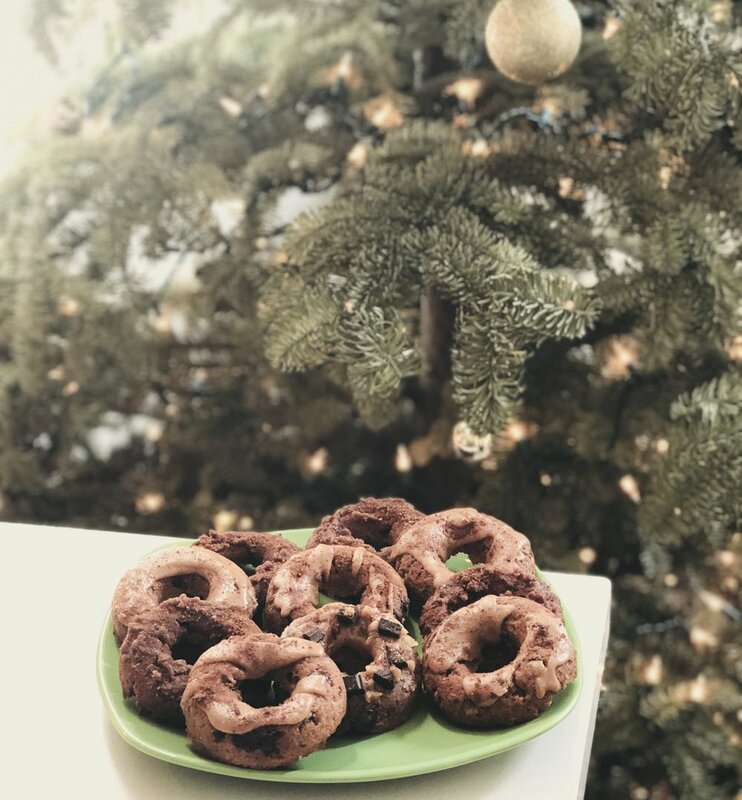 * For some extra aesthetic points (and taste), mix up coconut sugar and cinnamon in a bowl and sprinkle it on top of the donuts for a delicious cinnamon sugar. * I also did a few donuts with dark chocolate peanut butter frosting (added dark chocolate into the peanut butter frosting... but to be honest I preferred them with just the coconut & peanut butter). In a large bowl, mix together the muffin mix, the flax egg, the water, the coconut oil and the banana until very well combined. Stir in coconut flour and allow to sit for a minute to absorb. Scoop batter into donut pan and fill the donut compartments leaving a little extra room for them to rise. Bake for 18-20 minutes until the doughnuts are risen and slightly golden around the edges. Let them cool, and then take them out and add frosting. ENJOY!